Total Weight: 2.45 grams. Make in USA. Welcome to Merinda Jewelry! Product Information Metal: 24k Solid Yellow Gold ( 9999 Stamped) Length: 2.00 inches Total Weight: 5.40 grams. Make in USA There are an additional Tax for CA Residence. We're going to ship at the same day of your purchase except weekend and holiday only. Please feel free to ask if you have any questions. Thanks For Your Purchase merinda Store merinda Store ￼ ￼ merinda Store Present your best items with Auctiva's FREE Scrolling Gallery. 24K Yellow Gold .999 Teardrop Jesus Cross Crucifix Crystal Pendant 1 1/2"
24K Yellow Gold. 999 Teardrop Crystal Jesus Cross Crucifix Pendant 1 1/2" Jewelry. THIS CRYSTAL PENDANT MADE BY CLEAR ACRYLIC . We promise satisfy you all 100%. Welcome to Merinda Jewelry! Product Information Metal: 24k Solid Yellow Gold ( 9999 Stamped) Length: 2.75 inches Total Weight: 20.70 grams. Make in USA There are an additional Tax for CA Residence. We're going to ship at the same day of your purchase except weekend and holiday only. Please feel free to ask if you have any questions. Thanks For Your Purchase merinda Store merinda Store ￼ ￼ merinda Store Present your best items with Auctiva's FREE Scrolling Gallery. 24k Solid Yellow Gold Cross Pendant. 24k Solid Gold (Stamped). • 7.40 Grams. Must Be in Original Condition! Be Aware of Not Satisfy?. Total Weight: 3.65 grams. Make in USA. W@W Pamp Suisse 5g 24k gold HOLY CROSS pendant 4 necklace 14k bezel. NOT SCRAP! NEW UNUSED/UNWORN New Religious Collectors Series Pamp Suisse 24k gold HOLY CROSS bar in a new 14k gold bezel & bale! PERFECT SIZE AND WEIGHT! A VERY VERY NICE ELEGANT PIECE, AND YOU CANT LOSE WHEN INVESTING IN GOLD NOR WILL YOU FIND A BETTER PIECE FOR THE PRICE! PRIMA GOLD by PRANDA. It is the unique history of gold that is the source of inspiration behind Prima Gold. The result is not just any ordinary gold jewelry; it was the birth of Prima Gold, absolute pure gold jewelry in 24K with 99.9% purity. The Bull and it's rider are plated with 24k gold for the feature point. 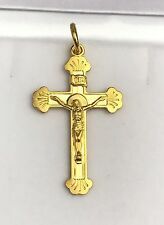 24K Yellow Gold Religion Cross Jesus Pendant. • Style : Pendant. KTS Jewelry. • length: 30 mm x 18 mm. You can be certain that we will do everything we can to make sure your item arrives quickly. Material: sterling silver & 24k gold Hallmark: Gurhan 925ag. We are the consummate online presence for Signed pieces, luxury watches and estate jewelry. Our goal has, and will always be, to make your wishes a reality. 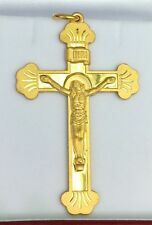 24K Yellow Gold Religion Cross Jesus Pendant. • Style : Pendant. • Weight: 3.7 grams. KTS Jewelry. You can be certain that we will do everything we can to make sure your item arrives quickly. Jewelry (2470). Jewelry by Marcus ©2018. Once an order is placed it cannot be modified or cancelled. Watches (3). Bail Fits: 2.9 mm. Thickness: 3.2 mm. Width: 7/16". • Style: Cross Jesus Religious Pendant. KTS Jewelry. You can be certain that we will do everything we can to make sure your item arrives quickly. 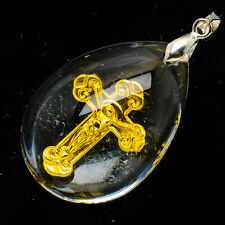 24K Yellow Good Filled Jesus Cross Pendant Necklace 18" Chain Link Jewelry Hot. It does not flake off, tarnish or discolor. Gold filled jewelry is an economical alternative to solid gold jewelry! Although it isn’t solid gold jewelry. Total Combined Weight Is 10.00 Grams. In 24K Yellow Gold Plated. ·24K Yellow Gold Plated. We carry fine jewelry from 7 of the top fine jewelry manufacturers in the world. And we will always go the extra mile to assure that you have an excellent purchasing experience. 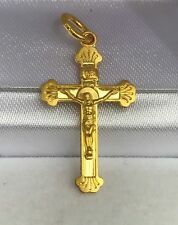 24K REAL GOLD FILLED CROSS NECKLACE PENDANT. AAA LENGTH CHAIN 45 CM. Pendant size : 1.8 X 2.9 CM. ALLOY LEAD FR. IDEAL FOR SENSITIVE SKIN WHO CAN WEAR SOLID GOLD. WEIGHT: 15g. 1.8 GRAMS. ALMOST PURE GOLD. Pendant Size: 7/8" Length. Chain Size: 24" Length.